"We started out as seven friends, just jamming and writing some songs, and then this just kind of happened," says Neil of Cardiff, Wales' bright new band, Los Campesinos! "It's really weird. I'm having a conversation with someone from America, interviewing me. It's really mental. It doesn't make any sense." Los Campesinos!' rise as one of the U.K.'s newest buzz bands has been swift. The band originally formed as a trio only two years ago, and it wasn't until March of 2006 that it finally expanded to its current seven-member status. 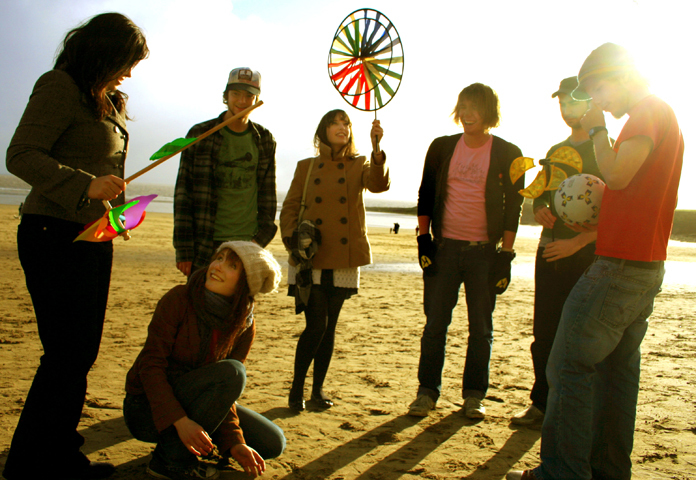 Neil (guitar/vocals), Ellen (bass/vocals), Ollie (drums/vocals), Tom (guitar/vocals), Gareth (vocals/guitar/glockenspiel/clapping), Harriet (violin/keyboards/vocals), and Aleks (keyboard/clapping/melody horn/vocals), all of whom adopted the last name Campesinos!, currently attend Cardiff University, and six of the seven are in their last year. Things started picking up in the summer of 2006, after the band posted four demos on their MySpace page and a link on the U.K. music website Drowned in Sound. Within days, the Internet community was alive with interest. Soon, the band had two sold-out London concerts, the first shows it ever played outside of Cardiff, and record labels, both indie and major, came calling. The band's double A-side debut single, "We Throw Parties, You Throw Knives"/"Don't Tell Me to Do the Math(s)," is filled with multi-instrumental, ultra-melodic indie-pop, influenced in part by the band members' love of Pavement and Broken Social Scene. "We didn't want to sound like another post-Libertines band," says Neil. "There are so many bands over here now that are just doing this same thing, and it's getting pretty dire. It's kind of the same thing over and over again. Bands just seem thrust into your face that are just not that good." Los Campesinos! has also already managed to strike up some controversy. Listeners have suggested that "We Throw Parties, You Throw Knives" is an anti-war song, and while its animated soldier-filled video does little to suggest otherwise, Neil says that the song is not about war at all. "It's just about going to parties where everyone's just cooler than thou with all these people dressed up really cool," he says. "And also it's about idiot students. Because we're all students, there's a lot of student clichés. You go out and get really drunk and dress up and do stupid, crazy things, so it's kind of taking a dig at that as well, because we're not really into that." For now Los Campesinos! hopes to take it slow. Except for Aleks, who is studying medicine, the band members plan to graduate at the end of the spring semester. A second single is tentatively slated for June, with a full-length album to be recorded hopefully sometime in the summer and released in the U.K. on Wichita. It's a path much different from many of the U.K.'s next-big-things, who hit it big and then fizzle out in empty hype. "We're quite happy to take our time," says Neil. "We've always thought we wanted longevity of a career. We'd rather be, in five or ten years time, still being in the band, writing songs and playing to people, and not just be some massive band for the next year and then have no one care anymore."